I'm very pleased to announce that I won the Kent Wedding Photographer of the Year category at the 2013 Kent Wedding Awards last night. Thankfully winners were not allowed to give speeches. An exceptional number of high standard submissions were received for this popular category, but judges were particularly impressed by David’s stunning portfolio of photos which stood out as being almost alive in their quality. Albums told a story of the day from start to finish using really natural, relaxed images. All criteria were met or exceeded. 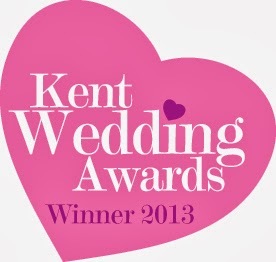 Apparently the Kent Wedding Photographer category was so hotly contested this year that they're thinking about introducing another category for photographers next year to relieve the pressure - so I'm exceptionally proud to have received this award.